Take a gander at all the doodles I've drawn through out the month. I'll be posting sketches on building my characters, What the drawing looks like before and after color, and I might also throw some random nonsense or cool drawings from my other artsy fartsy friends and awesome people I admire. Success! I was so proud to pull of this glare. I think I can still approve upon it, however this is a great start. Thanks for reading my step by step coloring and I hope it's been of any help. I'll be posting more in the future, perhaps I'll tackle my Illustrator style of coloring. Until then, smell ya later! Lastly I added some shine in the entrails. I also wanted to try out a glare from the sun. Never tried it before so I though I would start on the top layer, above the inks, give the circles a transparency and color them in a spectrum. I used a liner burn for the clouds to look like they are. It seems to highlight the color underneath and the specks with in the cloud. I shade the clouds with a dark orange color bordering on brown. I figured they will lend with the color of the clouds. The end result was really effective. I think the clouds came out rich and vibrant. A great highlight to contrast when I will shade the clouds. And as you can see I began shading the entrails with grey. I wanted to experiment a little with highlighting the cloud. So I tried a greenish grey color. I had no idea how it would turn out. Now the foreground, I add the golden orange color to contrast with the Tripod. I also erase little specks with my brush. It gives a translucent look to the could and it's kind of my style. 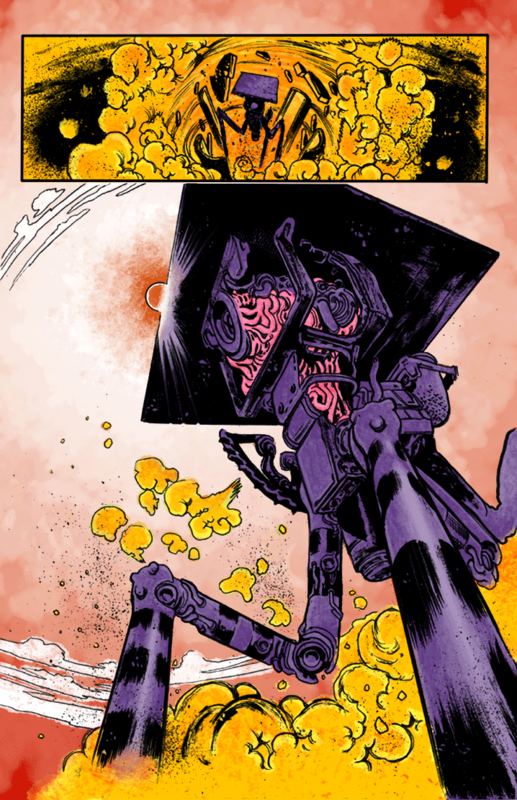 I also began coloring the brain like entrails that seem to be piloting the machine. Naturally I chose magenta. In this instance, I applied a color burn on the robot and shade to create depth in the picture and to highlight the pale violet underneath. A lot of times, when I shade, I start with a neutral color like grey. It gives the perfect balance between a burn and a dodge. You could go either way with it. Phase 2 is the mid ground. I block out the Alien Tripod with a pale violet color. I have plans to color the dust and sand with more of golden color, so I figured coloring the machine purple would contrast well with the cloud of dust. To finish off the sky I just added a bit of color in the sun and a little color around the sun. Then I used the same Erasing technique on the first flat color, because I wanted to leave some positive space to show the sun shining bright. I think it's even more effective now because of the contrast between the white and the rust color. I placed a Burn transparency on the last flat to give a rich and vibrant look to the sky. Almost like a setting sun. Next I wanted to add depth to the sky so I wanted to shade with the rust colored blood orange to keep with warm color scheme. I then erased the background through transparencies focused around the sun. Each stroke becoming greater with each stroke to give a illuminating effect. As if the sun is radiating light. I start off with a flat color for the sky. My initial thought was a blue sky, but after re opening this project with fresh eyes, I felt like warm colors would suite it better. So I chose this pale cream color as my base. Here's the original black and white by James Harren. 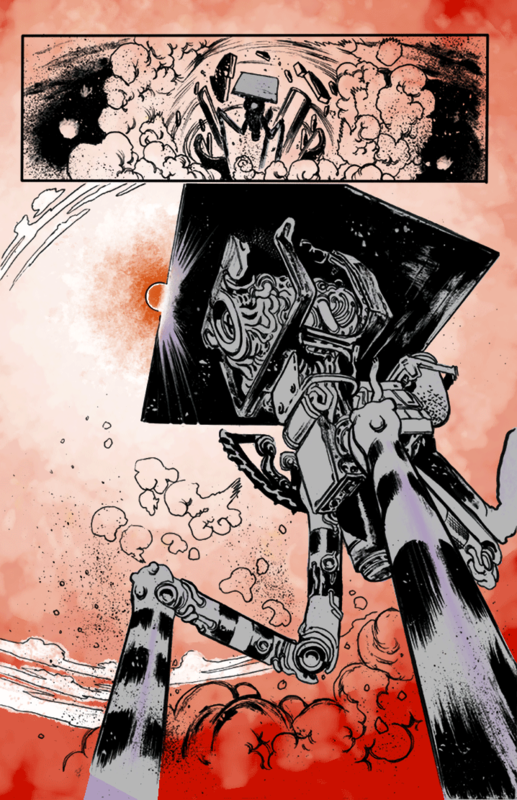 Here's another coloring tutorial, inks brought to you by James Harren. Check out his twitter page at: https://twitter.com/JamesHarren1 he's a hella dope artist and much thanks for letting me barrow this masterpiece. Today's inks is brought to you by James Harren. I've attached a link and please check him out. He's a really great artist and is one of my personal favorites: http://jharren.deviantart.com/ the bottom page in color was done by James and it was reference for me to go off of. This is one of the main reasons why I chose this page to color. It's always great to have a example to go off, b/c you're never sure which lines are attached to what. There were a couple of times I had to refer to the colored page to double check. Above that is the page in which James inked. The third page above the black and white is my doing. I typically start off with basic colors to fill in the characters and background. I want to block every shape on the page before I shade. The fourth page is me beginning to shade. I use a medium grey color as my contrast and then I adjust the transparency to get the appropriate contrast I desire. The end product is the last page on the top. I wanted to try a new technique with painting a glare from a light source. I think it looks pretty cool, however, I believe It could use some more practice. Hope you like how it turned out and thanks again to James Harren for using your inks. Hit me up if you have questions and comments and please share and like. When I started to draw these Disney prints, Jack and Sally was the first on my list (it's my personal favorite). It took me awhile but I finally got to it and it's actually pretty popular, believe it or not. I suppose the whimsy of this movie is still going strong.